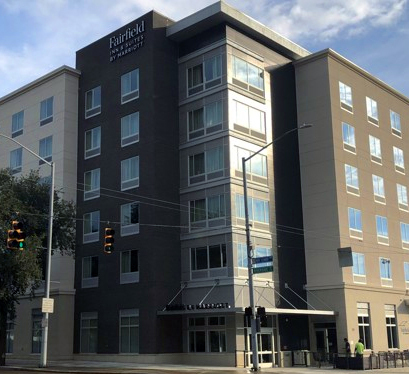 Downtown Dayton welcomed the first guests at the new hotel, The Fairfield Inn & Suites Dayton, after it opened earlier this week. Shaner Hotels management company operates the Fairfield Inn & Suites at 305 E. Monument Ave. and also co-owns the hotel with Columbus real estate company and Water Street developer Crawford Hoying. The 6-story Marriott property offers 98 rooms featuring a mini-refrigerator, microwave and smart TV. Amenities include a fitness center, on-site laundry facilities, a business center and complimentary WiFi. There also are daily dining options available for guests, including complimentary breakfast, a lobby bar serving light fare and The Market, which has snacks, drinks and other items available for purchase. The hotel bar will be open to the public in the evening hours. To make a reservation, call (937) 331-9330 or visit www.marriott.com.